When young Knox presented himself at Washington’s headquarters, our army was destitute of cannon, without which he felt that it was impossible to cope with the British forces. This claim, that the Continental Army had no artillery until Knox brought some back from the Lake Champlain forts, pops up in a lot popular sources, though few historians who’ve studied the record make the same mistake. Many sources show that the Massachusetts Committee of Safety began to collect artillery pieces for an army in the fall of 1774. Their agents sought cannon from ships, shore batteries, militia armories, and hardware stores. 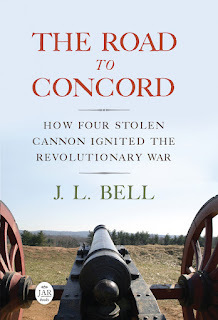 In early April 1775, James Warren wrote to his wife from Concord, “This town is full of cannon…” During the Battle of Bunker Hill, four American artillery companies deployed with eight field-pieces, though by the end of the day they had lost five. Knox’s trek to Crown Point and Fort Ticonderoga in the winter of 1775-76 certainly added to the Continental Army’s artillery. He and his men brought back forty-three cannon, including one brass 24-pounder and eleven 18-pounders, one brass and ten iron. July 1st . Saturday. We are fortifying on all sides, and making it strong as possible around the Fort. We have two 24 lbs. Cannon, & forty balls to each. We have hauled apple trees, with limbs trimmed sharp & pointing outward from the Fort. We finished one platform, & placed the Cannon on it just at night, and then fired two balls into Boston. Knox helped to lay out that fortification, which attracted praise from Gen. George Washington and Gen. Charles Lee four days later. 6th. Frid. About 9 o’c. A.M. we flung two 18 lb balls into Boston from the lower fort, just to let them know where to find us, for which the enemy returned 90 shots. Clearly the Continentals were outgunned by the Royal Artillery, and had a lot less gunpowder and shot to use. But it’s a myth to say that Washington’s troops had no guns or even no heavy guns until Col. Knox got back from Fort Ticonderoga. I’ll have more to say about the myths and realities of the Continental artillery tonight at Longfellow House–Washington’s Headquarters National Historic Site. We can't forget the four British cannon, stolen from Boston Common in 1774 and hidden at Col. Barrett's farm in Concord in April 1775. 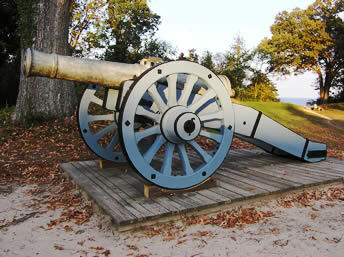 Those cannon were, in fact, the primary reason for the British expedition to Concord on April 19. But the Regulars returned to Boston empty handed, and those cannon were certainly available to the American army in the winter of 1775-76. As a "history detective", John, you should be more aware of those four cannon than most historians! Those cannon are my babies! They appear in some Massachusetts records, and Dr. James Thacher mentioned them in his journal during the siege. But they were also so small (two- and three-pounders) that they were probably close to useless at driving the British forces away. See Boston1775.blogspot.com for Sept. 27, 2008, for more about the cannon at Concord. Yes, Charlie’s comment above was joking about my early research about four small cannon from Boston that turned into this episode of History Detectives, this display at Minute Man Park, and support for this expansion of the park. We couldn't have done it without your efforts, JL.